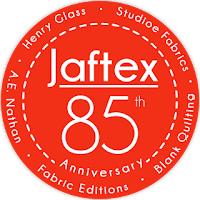 Today's my stop on the Jaftex 85th Anniversary Blog Hop. 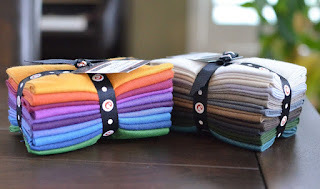 Jaftex abrics sent me a gorgeous bundle of 20 Studioe Peppered Cottons to use to create a project of my choosing. 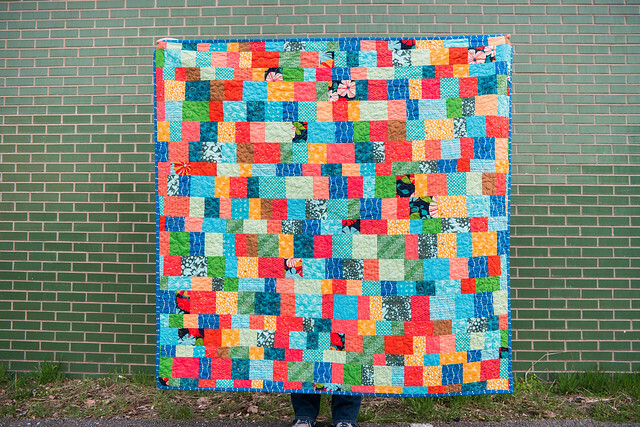 I love the saturated colors in this line and designed a quilt that uses about a fat eighth of all twenty colors in the bundle. 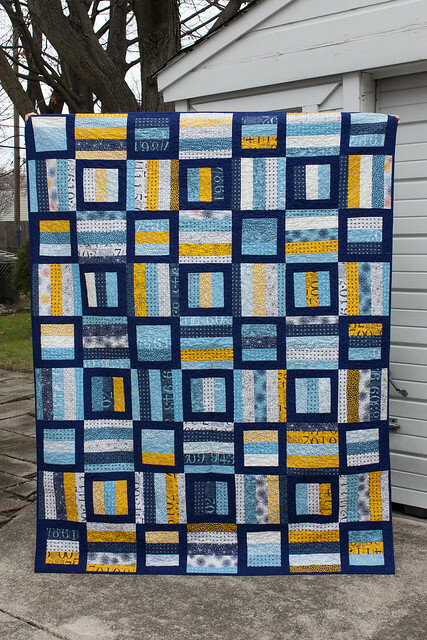 To create this quilt, I first cut out strips of fabric that were 8" wide. Then I cut the strips into pieces that were 2.5", 3.5" and 5" tall. I arranged the fabrics in a gradient and then altered each column of fabric to make a pixelated design. 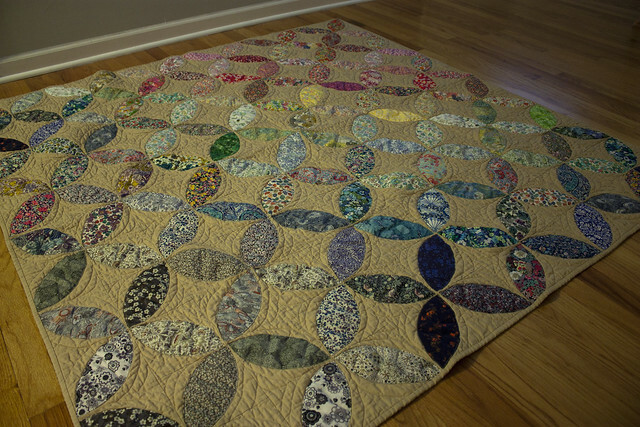 The finished quilt measures around 54" x 56". 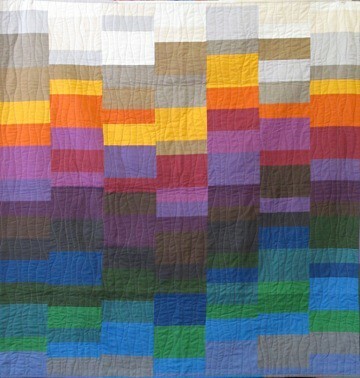 I quilted vertical organic lines to create movement in the quilt. 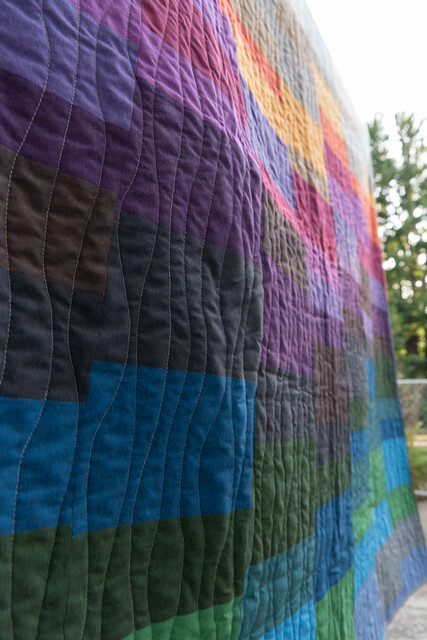 Combined with the fabric's hand, this quilt has such a great texture. 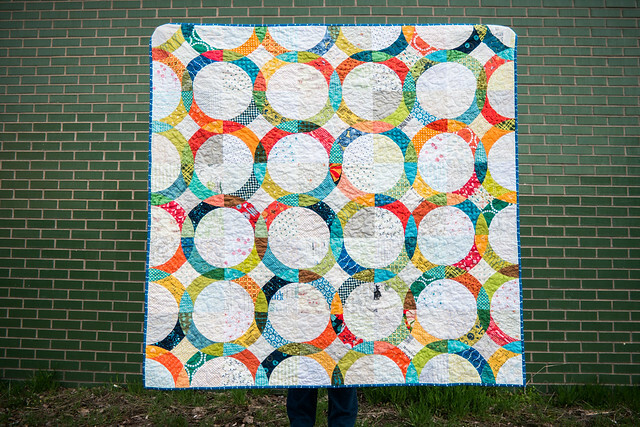 As a special bonus, I'm giving away a bundle of 20 fat quarters - one of each of the colors featured in my quilt as seen in the photo above. Please leave a comment to be entered into the drawing. 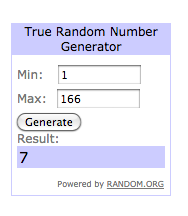 I will choose a winner at random on Sunday, September 27. I will ship anywhere in the world, so feel free to enter even if you are not in the U.S.A.
UPDATE: Congrats to commenter number 7, Dudette! I will contact you to arrange for shipping. Be sure to enter the Grand Prize Giveaway, too! This month I'm participating in my first ever blog hop. 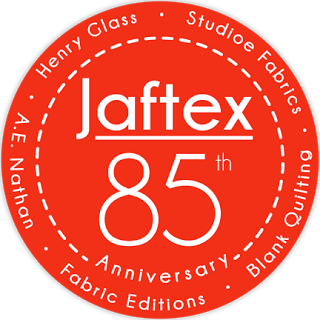 Jaftex, parent company of Henry Glass & Co., Studioe Fabrics and Blank Quilting, approached me about making a quilt with Peppered Cottons and I happily agreed. 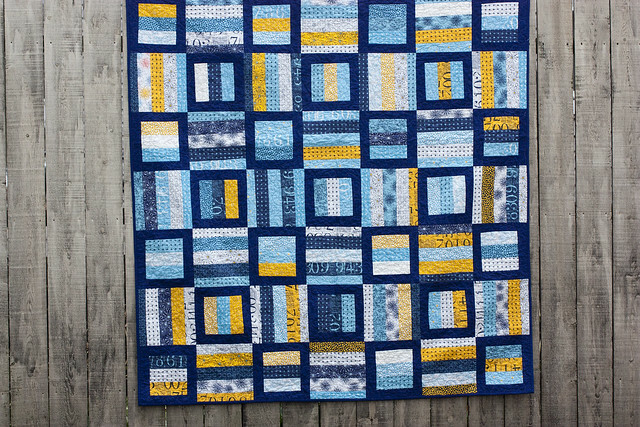 I'll be back later this month with the quilt that I created and a fun giveaway. September 29 –Jenny atMartingale& Co. Along with prizes offered on each blog stop, there will also be some incredible prizes offered as a grand prize!!!! 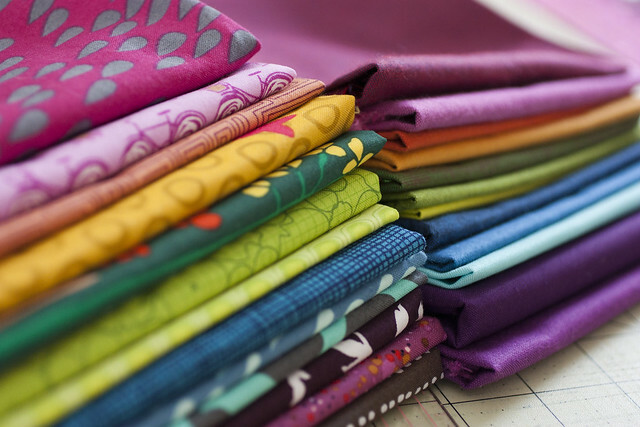 You can read all about those prizes and enter to win them at the Henry Glass Fabric Blog Here. 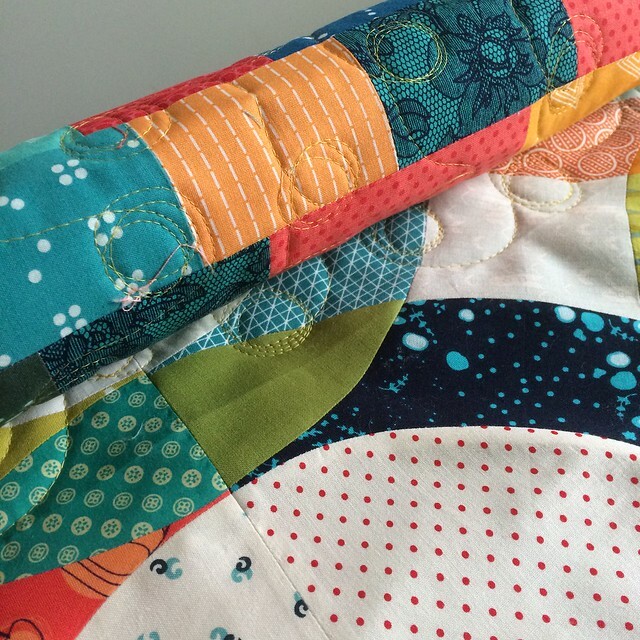 Last fall, I participated in two different mini quilt swaps. 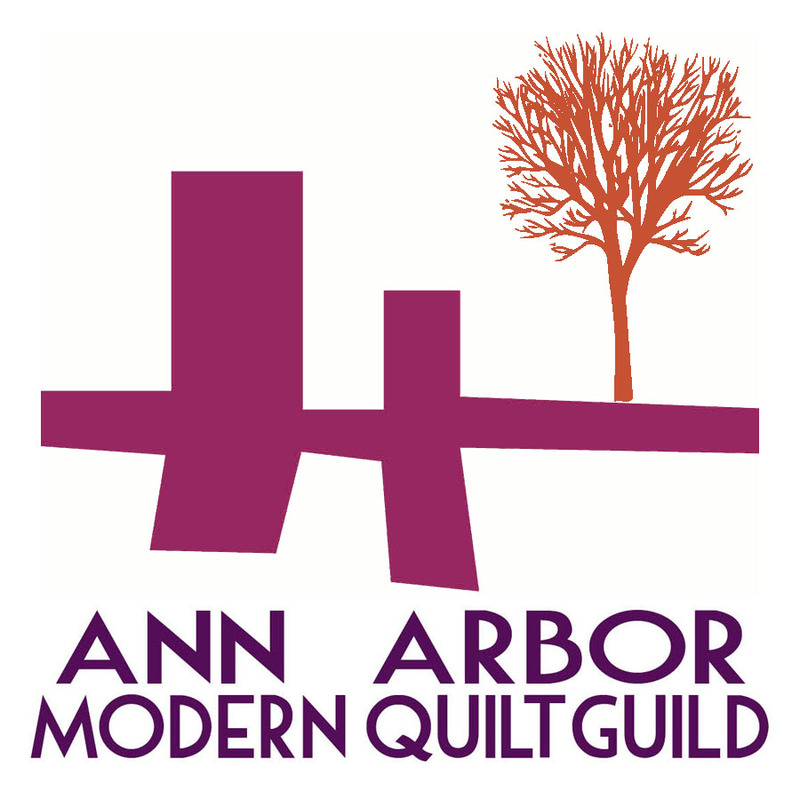 The first was our guild's popular "Super Stalker Mini Quilt Swap" in which each member draws a name and then has two months to make a quilt that would fit their partner's interests and tastes. I drew Hayley's name. We are both book and rainbow nerds, so I pulled together a collection of rainbow prints and coordinating peppered cotton solids to make a rainbow bookshelf quilt for her. Hayley and I just so happened to draw each other's names in the swap and she made me the most beautiful Celestial Star mini. 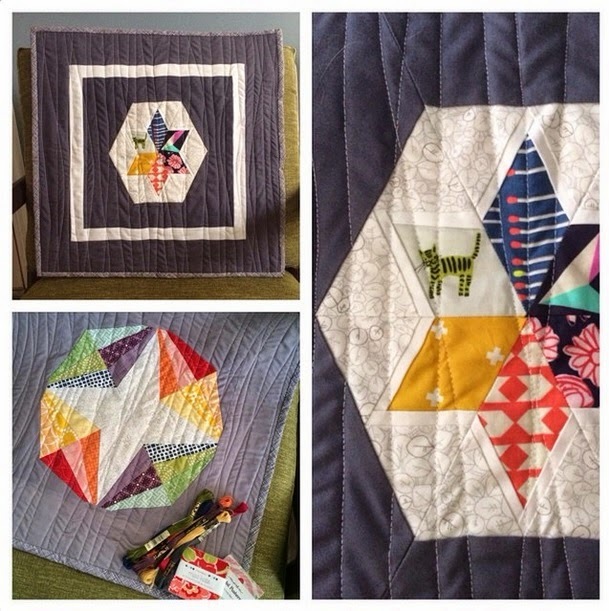 The second swap was the Quiltcast Podcast Mini Star Quilt Swap. I was very stumped as to what to make my partner. She listed minimal information about her interests and had no online presence (blog, pinterest, instagram, etc.). If I ever join another online swap, I will make sure that the requirements involve at least making an inspiration board of 3-5 images. It's so tough for a planner like me to know what to do without a particular style or direction from which to work! 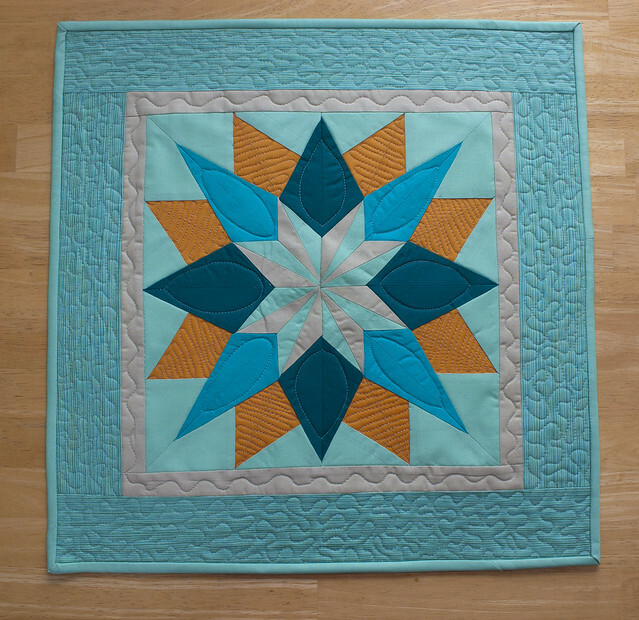 My partner listed her favorite color combination as orange, aqua, and teal, so I took those three colors and made a paper-pieced star. I used Elizabeth Dackson's Lucky Stars Block of the Month paper-pieced star collection for this. 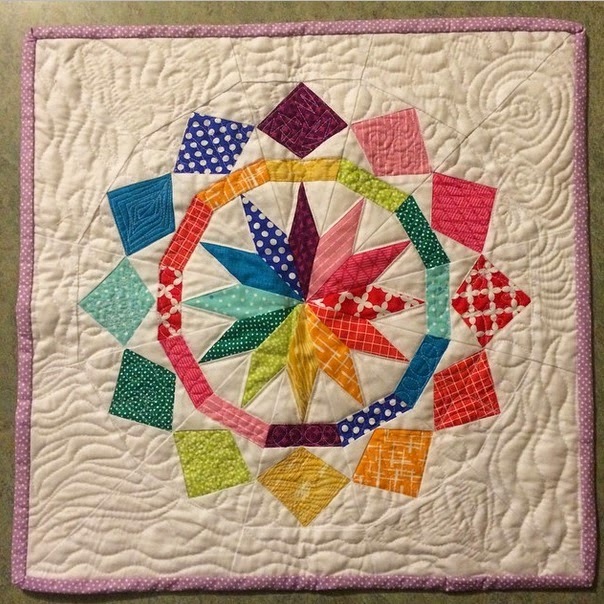 I saw her finished mini quilt for November, the Arcadian Star, and copied some of her free motion quilting techniques on my star. My partner, Monica, sent me the nicest double-sided mini! 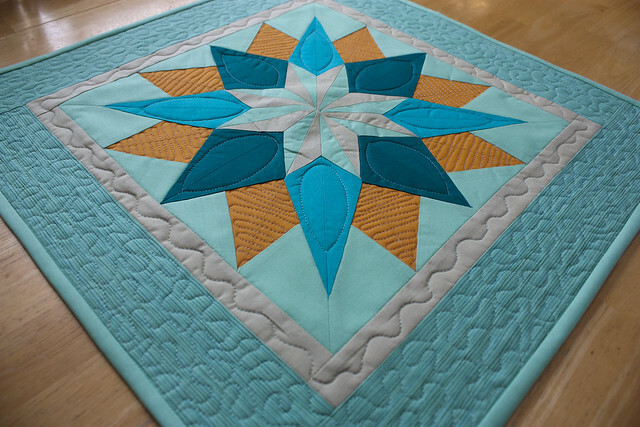 Her paper piecing is so impressive and I just love the organic lines she used for quilting. She also included some embroidery floss to feed my cross stitch addiction and two sweet mini charm packs. 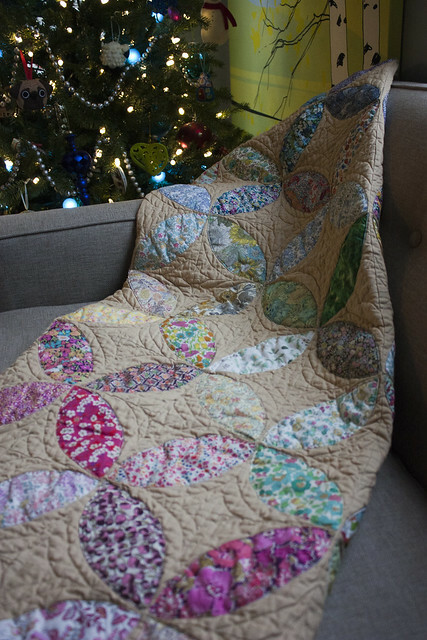 Last year, I began stockpiling Liberty of London fat eighths and sixteenths from Queen Bee Fabrics and the Westwood Acres Liberty club with the hopes of combining them all into a floral patchwork quilt for my mom. 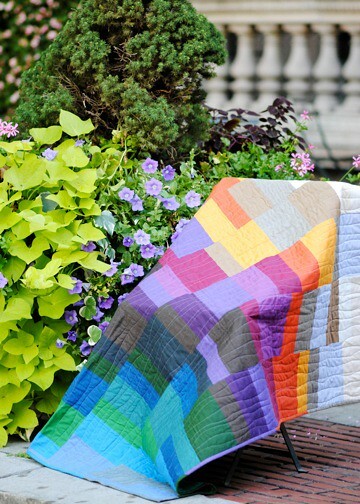 At first I settled on a checkerboard patchwork quilt like this from Red Pepper Quilts. Then I changed course and decided to make an orange peel applique quilt using the Orange You Glad tutorial from Crazy Old Ladies. Cutting and piecing the orange peels: This is so fun. 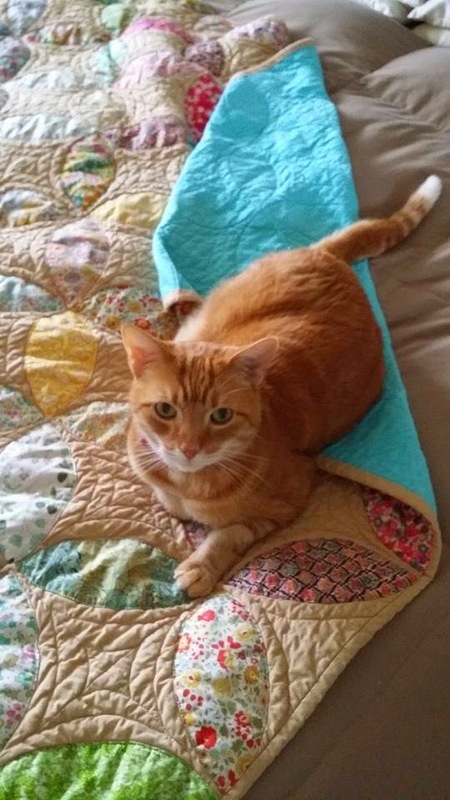 I should only make orange peel quilts from now on. Fusing the orange peels to the background fabric: These are coming together so fast. This thing is almost finished. 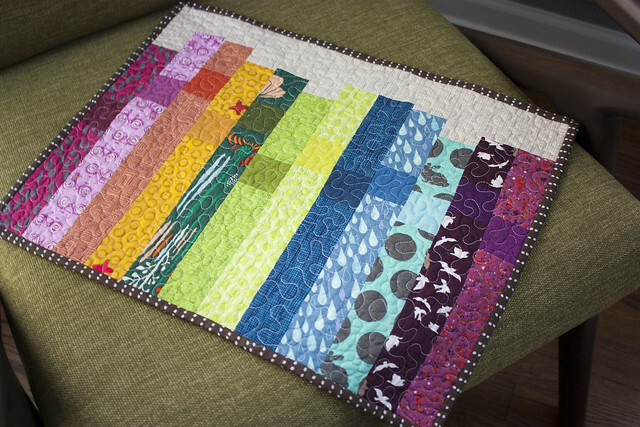 Deciding to lay out the quilt in a rainbow gradient: Love this. Now I want to make one for myself. I should have bought two of everything. 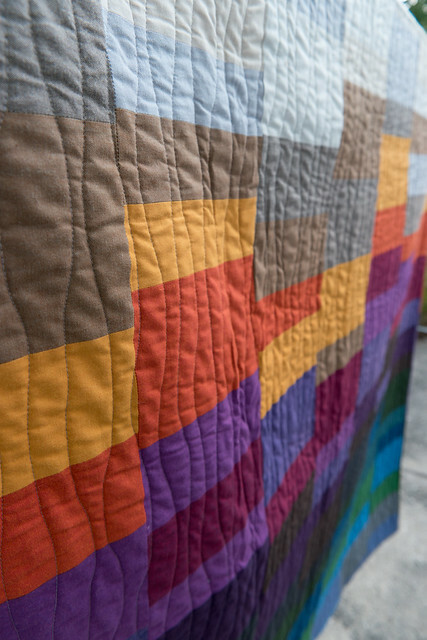 Basting the quilt: So close to finishing! 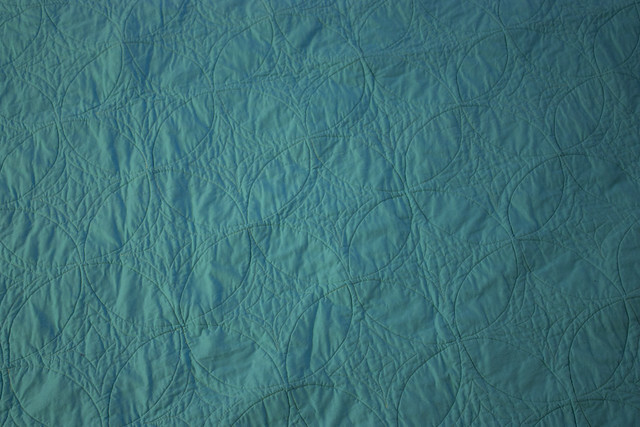 Quilting the top: Yep, that free motion foot is not going to work for outlining these curves. I guess I'll have to use my walking foot. 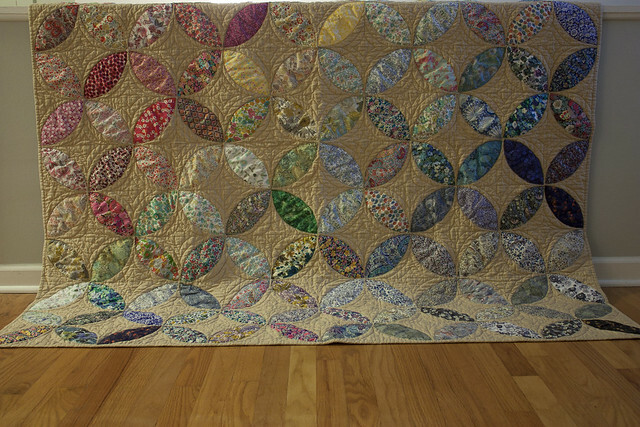 Days later after sewing the peels: Finally, finally, finally ready to free motion quilt the rest! 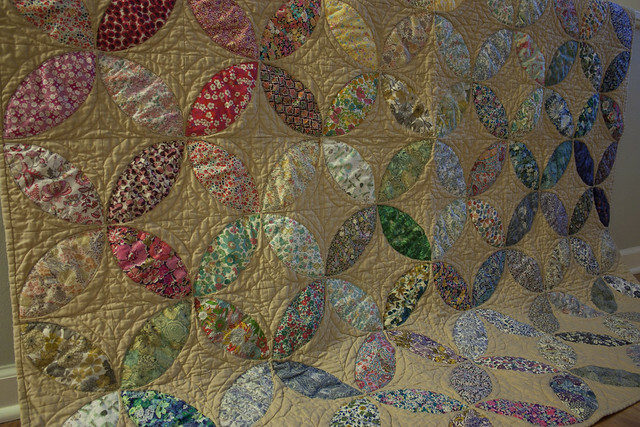 Needless to say, sewing down each of these petals with my walking foot and maneuvering the quilt in a full circle around each of the peels was the worst and most time consuming part of this whole quilt. 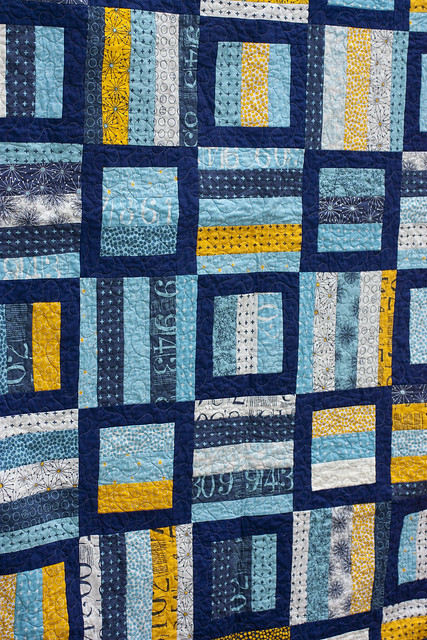 Luckily, the quilting outlines on the back make up for the hours and hours of turning this quilt around. 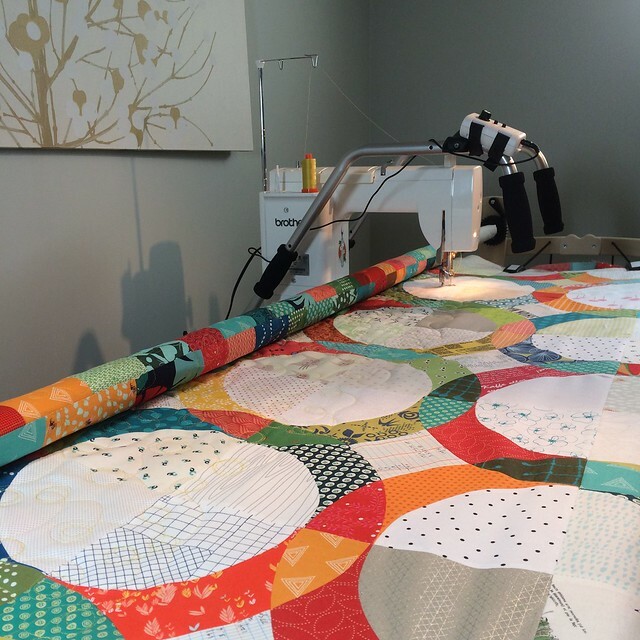 I have a new found respect for quilters who tackle spiraling circle quilting and know that it's definitely not for me! The quilt now lives draped on the foot of her bed as a reminder to me that I should probably have made my parents a queen-sized quilt to cover their entire bed. One of these days...one of these days. Her kitty, Charlie, is pleased with it nonetheless! 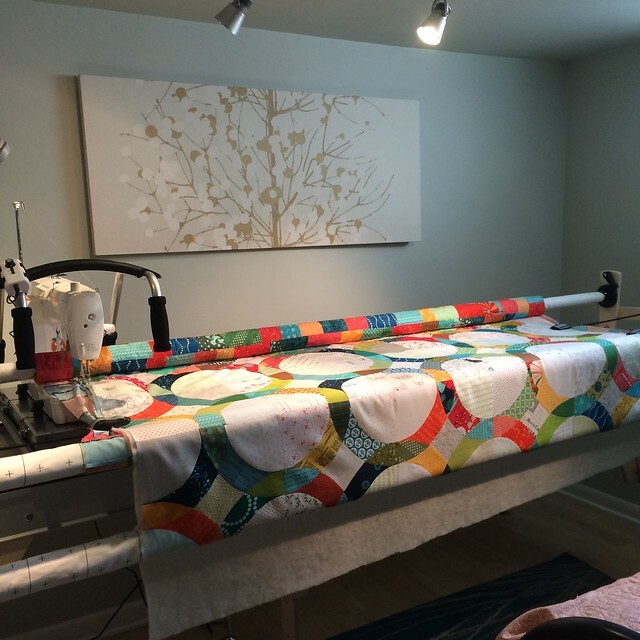 sewing room update & a new machine! 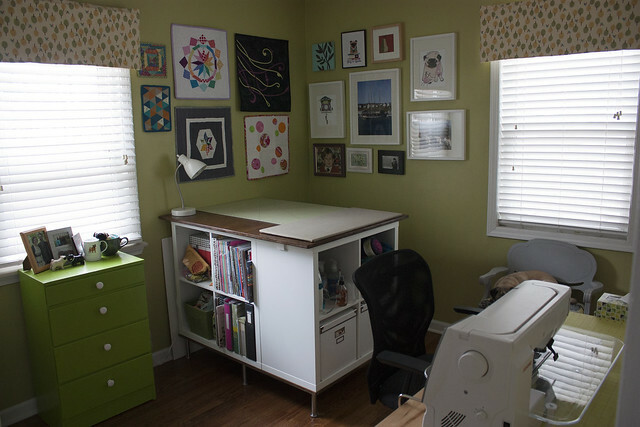 I’d always dreamed of having a design wall and a counter-height cutting table in the future sewing room of my dreams because I couldn’t figure out how to add them to my current space. 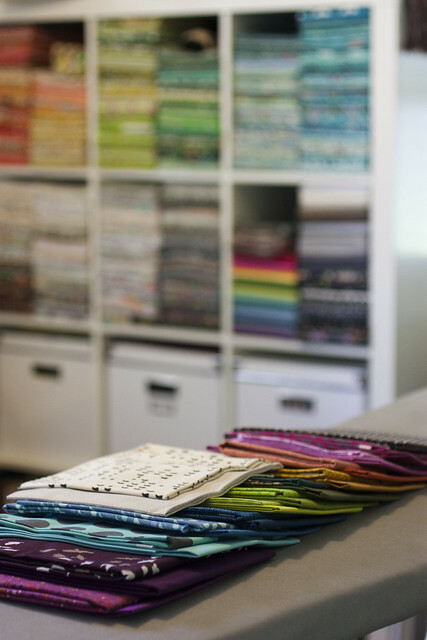 After brainstorming for a bit, I came up with a plan that would give me space for a design wall, fabric storage, and a counter sewing and cutting/pressing. In true Rebekah fashion, as Jon says, I came up with this plan on a Thursday and had it all in place and reorganized by Saturday night. Never resting until being fully content is a bit of a problem for me, but it does manifest itself in productivity and finished projects! I've had a couple weeks to sew and use my new space and I couldn't be happier with the setup. I was even able to fit an extra temporary table in here so my neighbor, Christina, and I could sew together. Here’s a few older tours of my room (2010, 2014). I’ve had the same furniture in place for 8 years, but have added craft supplies and moved things around a bit every so often. This time, I moved out my beloved 4x4 Expedit shelf and my long work table in favor of a more flexible layout. This room is small, at about 9 feet by 12 feet, and it’s made even smaller because the door is diagonal and cuts out a bit of space on two walls. 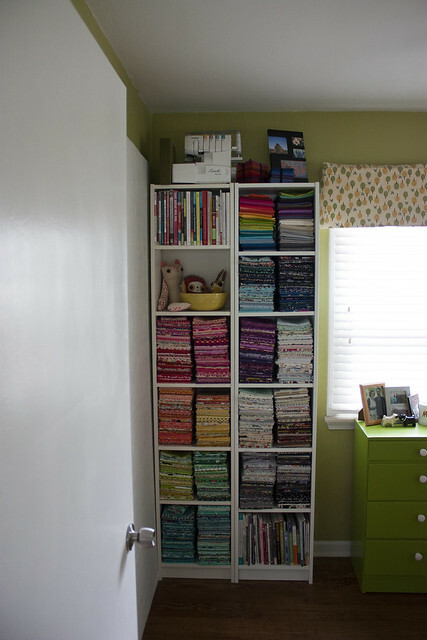 To the left of the door, I placed my new design wall, following Elizabeth Hartman’s design wall tutorial. I ran into a few roadblocks with this. Because I thought my room was 9 feet wide, I assumed that two four feet panels would fit side by side. Unfortunately, the diagonal door chopped off the width a bit so I had to cut off one foot of width from one of the panels. Then, because the two twin batting pieces that I had were only 90” long, I didn’t have enough length of batting to wrap around the full height of the foam, so I cut off a foot from each panel. 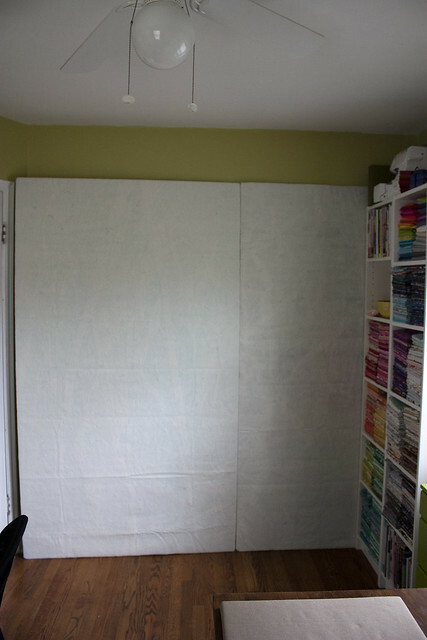 Now I have two panels that, when stood next to each other, are 7 feet wide and 7 feet high. It's been so nice to have a dog and cat free area to place blocks while the layout and design percolates. On the next wall, I added another thin Billy shelf and moved all of my fabric and a majority of books to this spot. I pulled the mini green dresser out of my closet to place under the window. It holds office supplies and cross stitch supplies. Next up is my glorious new cutting station. Jon and I built this after seeing a few tutorials on IKEA hackers. I used 6” Capita legs for the base (8 in total), then two pieces of hard oak plywood that’s ¾” thick. In between the plywood, there’s three 2x2 Kallax units. Because the Kallax units are updated, thinner versions of the old Expedit shelves, the width of one unit is not the same as the depth of two units put together, so there’s a 1.5” gap on one side of the end shelf. It doesn’t bother me enough to do something about it, but it is a bit annoying. I used a base of 41”x46.5” and a top of 36”x48”, which fits everything well. 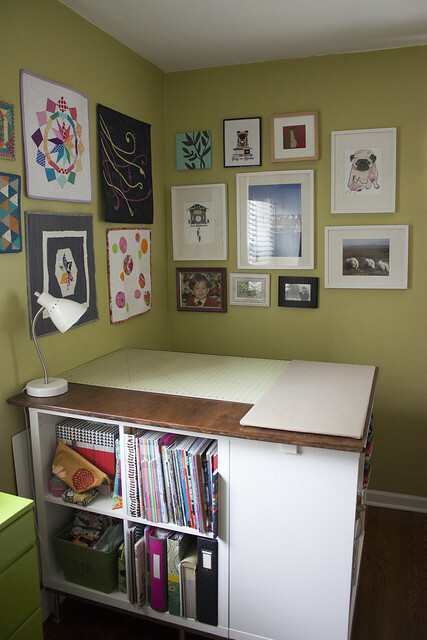 On top of table, I’m storing my cutting mat and a pressing board that I made following this tutorial. The wall holds my collection of minis from previous doll quilt swaps, guild swaps, and mug rug swaps. I organized my closet and got rid of some older tools, supplies and magazines that I no longer plan on using. I added a Gorm shelf to hold the rest and added a few more of these Trofast bins (suggested by Rossie) for holding works in progress. 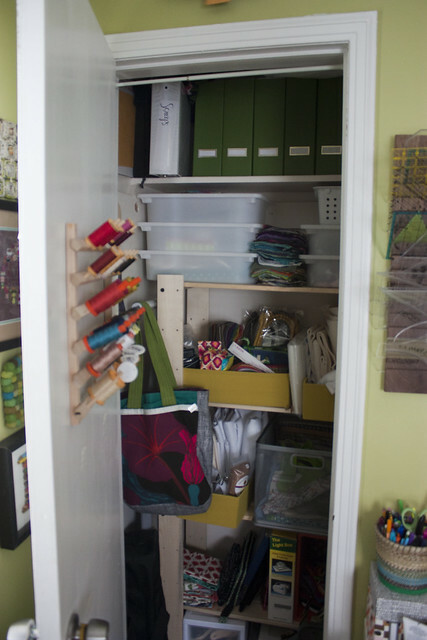 The large metal bin in there holds lots of mini projects and embroidery kits that are all cut out and ready to go. Hopefully these will be finished by the end of the year. The final wall holds my favorite tools. The old IKEA table I was using was made from separate legs and a base and wasn’t the sturdiest of tables. This table is a little deeper to hold my new sewing machine and does not vibrate at all while I’m sewing. 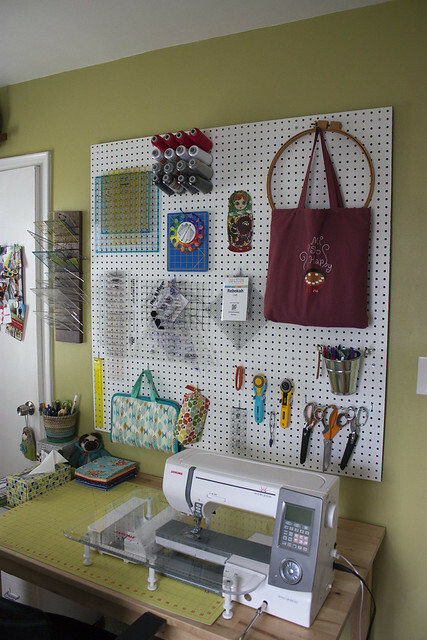 On the new pegboard, I now have a spot for all of my templates and tools. I love sewing gadgets and I love seeing things hung up in front of me to remind me of what I do own, so this is perfect for that. And speaking of new machines, I bought this Janome Memory Craft 8900 right after Quiltcon at a fantastically low show special from SewVacDirect. I’ve had it for over a month and have already made one quilt from start to finish and four new tops on it. I couldn’t be happier with my choice and feel like I’ve barely scratched the surface of what this can do. I was not expecting to come home with a new machine right after Quiltcon, but I sewed on it for a bit during the last hour of Quiltcon and couldn’t let it go. My dad is a professional night time TV napper who lives in a chilly house. 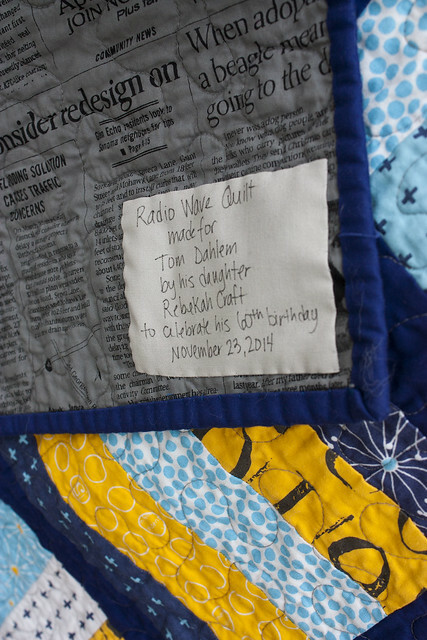 Naturally, his 60th birthday was the perfect excuse to make him a quilt. I used two jelly rolls from the Zen Chic Figures line, which were purchased at my favorite quilt shop, Stitched Studio Grand Rapids. I found a contrasting solid for the block borders. For someone who really enjoys picking out coordinating fabrics, this was a bit anticlimactic for me. Jelly rolls, while great time savers, just aren't my thing.